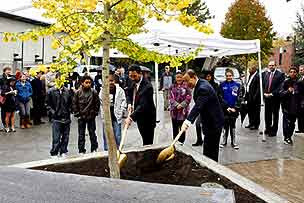 October 25: To celebrate Seattle’s contributions to protecting the global environment UN Secretary-General Ban Ki-moon (right, with shovel) participates in the commemorative planting of a Ginkgo tree in Seattle, Washington. "We have led a campaign that’s planted more than 7 billion trees around the world -– including, I might add, a Ginkgo Biloba I was honoured to plant yesterday at the Seattle Center." New cd/dvd by Yusuke Kamiji, a famous Japanese TV star : "Ityo" (いちょう,, translated as "Ginkgo") - to be released in November 2009. Symbol of hope and love: the Ginkgo tree (and many falling Ginkgo leaves). El subdirector del Ballet Nacional de Cuba plantó un 'Ginkgo biloba' en el Bosque de la Danza en nombre de Alicia Alonso, directora del Ballet Nacional de Cuba. "El director de la Casa de la Danza, Perfecto Uriel, explicó que el 'Ginkgo biloba' guarda gran relación con la danza: «crece muy poco a poco, pero es muy resistente». Al final, con el paso de los años, se convertirá en un árbol «gigantesco». Alicia Alonso, rebelde a las impertinencias de la salud, quiso dejar su impronta personal en el acto. Por eso, escribió una carta para agradecer «este signo de vida y esperanza». " 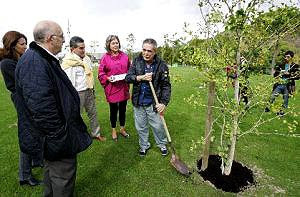 Este nuevo Ginkgo biloba es el duodécimo árbol que se planta en el Bosque de la Danza, ubicado en el parque de La Ribera, en la zona próxima a la confluencia de la calle Luis de Ulloa con el Paseo del Prior, Logroño, España. Lea más acerca de esto. * New topics: Ginkgo and loss of smell + Ginkgo and radiation damage. * Added video on Propagation-page: Ginkgo seeds in September. Great video on YouTube by Wolfratungs: the Ginkgo tree : "Un vídeo sobre este maravilloso árbol, espero que os guste." "The leaves turn a Bright Yellow which is an understatement. I think the tree is turned to Gold. Then within a few days, all the leaves fall to the ground as if overnight! They are very heavy leaves to rake and I sure did my share of raking them as a child.......It is depressing to see the once beautiful city Farmhouse I called home but soon my eye is taken up high to the GINKGO TREE, standing tall, In the Garden..."
"This Ginkgo tree, an ancient species from China, is located behind Slocum Hall. It bears a fleshy seed with a strong-odor. In the early 1960s, Ohio Wesleyan needed to enlarge its library in Slocum Hall. OWU planners spared this Ginkgo tree, and built Beeghly Library instead." "Actually, despite the putrid smell of (fallen - Cor) ripe Ginkgo fruit, many (myself included) anticipate their arrival every fall. Come October I stuff my pockets full of latex gloves and plastic grocery bags and wander the streets and parks of New York City breathing deeply, searching for female Ginkgo trees." 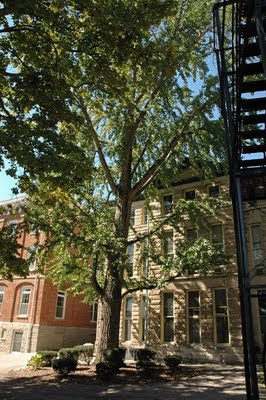 Read more about the female tree on my website The Ginkgo Pages. One of the most celebrated photographers of the 20th century, Irving Penn, made this photo 'Ginkgo leaves', New York, 1990. Irving Penn died last Wednesday, October 7th at the age of 92. Enlargement of this photo click here. 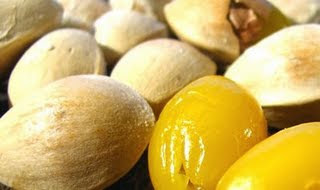 September 2009: Seeds (nuts) from female Ginkgo tree. Video taken September 29, 2009. Information and photos of the seed development can be found on my website. More videos of Ginkgo pollen, seeds and seedlings on this playlist. You can see many videos I made of Ginkgo trees on my YouTube channel. 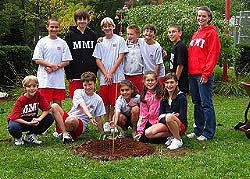 Sixth grade science class plants Ginkgo tree on campus of MMI Preparatory School in Freeland, Pennsylvania, as a practical example of their ongoing studies. The students are currently studying in Mrs. Laura Nemetz's science class. The planted tree was grown from seed by Mrs. Nemetz's brother, Rev. Thomas J. Petro. He collected Ginkgo seeds on an island (Antes Fort) in the Susquehanna River near Jersey Shore, PA, and grew seedlings from them. One of these seedlings is the now planted tree in Freeland!!! I am looking for the King of Dongting cultivar in the US…..any suggestions??? ?